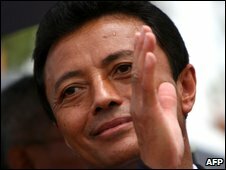 Madagascar's new leader has cancelled a controversial deal for a South Korean firm to lease a vast tract of land to grow food crops. Andry Rajoelina said he was axing the deal because the people should be consulted. Daewoo Logistics has reportedly expressed its frustration. The plan had helped fuel popular anger against President Marc Ravalomanana, who was forced from office on Tuesday. Mr Rajoelina has also suspended parliament and held a cabinet meeting. The BBC's Christina Corbett in the capital Antananarivo says he is trying to legitimise himself ahead of his inauguration as transitional leader on Saturday. After annulling parliament, he set up two transitional bodies to run the country. There is no word on the whereabouts of Mr Ravalomanana, who resigned on Tuesday when a group within the army backed his rival. Correspondents say Malagasy people have deep ties to their land and some had condemned the deal as "neo-colonialism". Widespread protests had already slowed down progress on the deal, which would have used about half of Madagascar's arable land. The South Korean industrial giant had sought to produce corn and palm oil on 1.3m hectares (3.2m acres), in one of the biggest deals involving foreign firms seeking to secure African farmland since food prices soared last year. 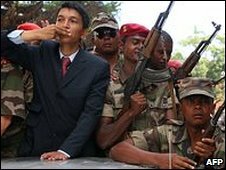 "In the constitution, it is stipulated that Madagascar's land is neither for sale nor for rent, so the agreement with Daewoo is cancelled," Mr Rajoelina told reporters. "We are not against the idea of working with investors, but if we want to sell or rent out land, we have to change the constitution, you have to consult the people. So at this hour the deal is cancelled." Daewoo's long-term aim was to replace more than half the corn that South Korea, the world's third-largest corn buyer, imports, mainly from the US and South America. Expressing frustration, Shin Dong-Hyun, who oversees the deal for Daewoo Logistics, told Yonhap news agency: "Already we have invested not a small amount in Madagascar. "We are just waiting and watching this situation to see whether to retreat."